Electro-Sensors 1102 magneto resistive sensors are used with magnetic targets such as 60 pole pair magnet wheels, pulser wraps, or pulser discs to provide digital pulse output signals. These sensors can be used as stand-alone pulse generators, or as an input to all Electro-Sensors products. 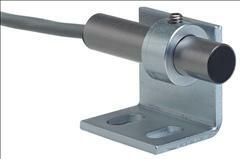 The 1102 Magneto Resistive Sensor is 7/16 inch in diameter, non-threaded stainless steel, and is 2 inches in length. It is supplied with a mounting bracket and 10 feet of 3-conductor shielded cable. The 1102 is the recommended Magneto Resistive Sensor for use with Electro-Sensors NEMA C Flange Ring Kits. 1102 sensors can be powered by 8-24 Vdc and have NPN Open Collector Outputs. They are switched low when the sensing surface is in the presence of a magnetic field, and are switched high when the sensing surface is not in the presence of a magnetic field (the null space between the magnets.) This provides a digital square wave output signal. The gap distance between the sensing surface and the pulse generator is dependent on the strength of the target magnets. The signal produced by the 1102 is compatible with most PLC Digital I/O cards and with other products requiring a digital pulse input signal. These sensors are also used in applications where only one magnet is present for counting, function start/stop, or orientation alignment of mechanical or electronic indexing equipment.